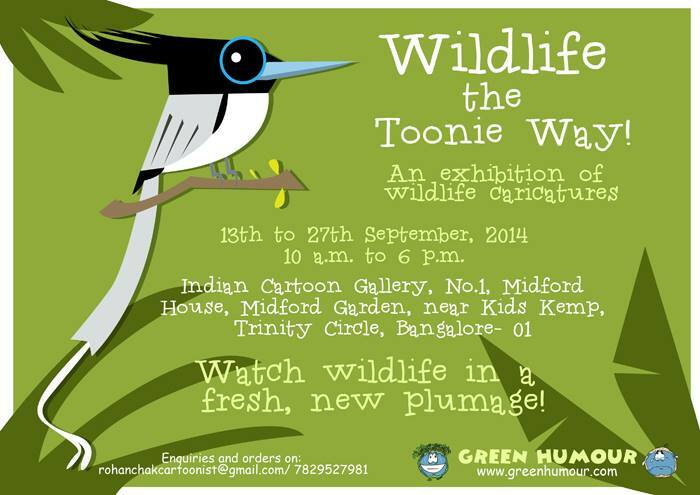 A quiet Sunday afternoon sees a steady stream of visitors to the Indian Cartoon Gallery, Bangalore. Chuckling and chortling, they work their way through the 70-odd species of birds and animals caricatured with eye-catching exaggerations, frequently pausing to learn about the animals, their behavior and habitats from the informative blurbs. is artist Rohan Chakravarthy’s first solo show. caught up with him at the gallery to chat about his art and his engagement with science and conservation. While cartoons are his first love, Rohan’s career is one that straddles art and science. He has done illustrations for articles and conservation campaigns. He also recently finished illustrating a field manual for WWF. In the pipeline are a line of merchandise for an ecotourism company and illustrations for a children’s book. In addition. he recently launched a website called vectoridae where he provides royalty free vector illustrations on wildlife. “It is intended for science, conservation and other wildlife related media. It is one avenue through which I can collaborate with conservation campaigns,” Rohan explained. Universities in the West offer courses on scientific illustration. While this remains a very unusual career choice in India, Rohan and others like him are opening up avenues and increasing the scope of the field. As I took a second look around the room, I was curious. Which were the animals or birds he found most challenging to capture? Does he have favourites? “The oriental dwarf kingfisher. It is only the most colourful bird in the world. It took me three attempts to get it right,” he said, without missing a beat. “I really enjoyed doing the crow. And the bush frog took me a whole day to paint and turned out pretty satisfactory, so I’m quite happy with it,” he added after a moment’s reflection. There is a very apparent attention to detail in his caricatures and cartoons. “I do studies of the animals before I go about drawing them. If there’s an animal I haven’t seen, then I watch videos, read up and only after that I draw a cartoon or caricature,” he revealed. Is he interested in teaching art, I asked. “Not in the near future. Maybe when I’m old and have nothing else to do”, he quipped mischeviously. Physicist turned science writer. I enjoy writing about interdisciplinary research and interviewing scientists about science and careers in science.